The billionaire seems to be back to his usual antics after a $US20 million settlement with the Securities and Exchange Commission. 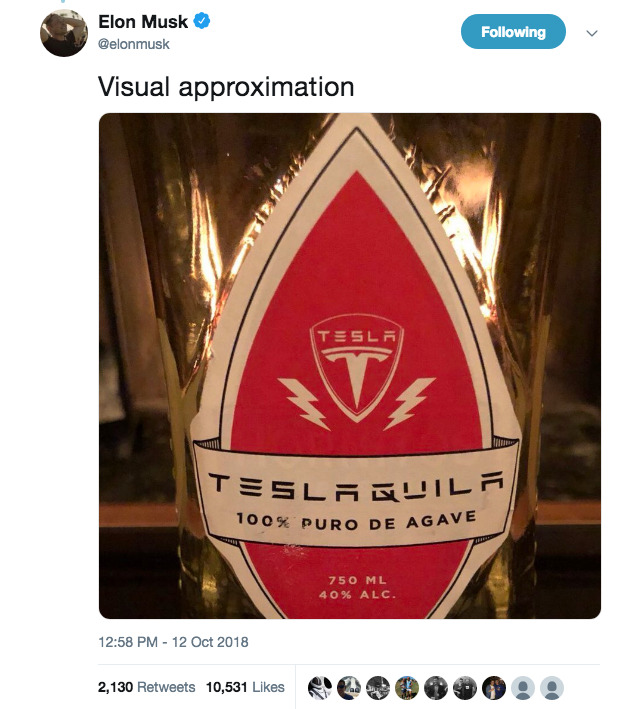 Musk’s mockup appears to be similar to one he posted on Instagram in April, which many took to be an April fools joke. Now, nearly half a year later, it looks like tequila could be the latest in Tesla’s arsenal of merchandise it sells to fans. For his Boring Company tunnelling venture, Musk raised $US1 million and drew media attention last year for selling 50,000 branded hats, and earlier this year, he raised $US10 million by selling 20,000 branded flamethrowers. Last week, Musk said the Boring Company would sell interlocking, Lego-style bricks made from rock and soil displaced by the company’s tunnel-digging machines. You can read every puzzling thing that has happened since Elon Musk tweeted that he had ‘funding secured’ to take Tesla private here.